Jeonju is a sprawling city in the southwestern region of the Korean peninsula. It serves as the capital of Jeollabuk-do and is home to a variety of historical sites. The original capital of the Hubaekje Kingdom and the home of the Yi family, the rulers of the Joseon Dynasty that controlled Korea for more than 500 years, Jeonju has a deep historical tradition that is preserved through both culture and intentional effort. Designated a UNESCO City of Gastronomy, one of the best ways to experience the culture is through food. The two most revered gastronomical wonders of Jeonju are bibimbap and makgeolli. Bibimbap, steamed rice topped with fresh vegetables, was originally a meal prepared for the royal tables of the Joseon dynasty. It lives on today as a staple of the Korean diet for all, but Jeonju seems to do it best. The dish is simple, but Jeonju’s location near quality farmland allows many eateries in the area access to fresh produce, making Jeonju’s bibimbap particularly delicious. To wash down your meal (for those of age) is the traditional rice liquor, makgeolli. The oldest of Korean alcohol, this fermented rice, barley, flour, and wheat. The mixture goes well with just about any Korean dish. The drink is also full of nutrients like amino acids and vitamin B. In terms of alcohol, it is about as potent as a good draught beer (6-7% ABV), and makes for a refreshing complement to the local fare. A little wandering or a peek at a free tourist map should point you in the direction of a number of restaurants to find these delicacies, but for a hint at finding some of the more local fare, please see our recap on a recent trip to Jeonju here. The old city of Jeonju has an array of heritage sites that are worth checking out for any traveler. Here is a list of some of the most prominent attractions. In the historical district of Jeonju, you can find over 700 traditional-style “Hanoks,” in which some residents still live. Much of the village, however, has been transformed into a visitor-friendly shopping and dining district. While keeping its traditional feel, the streets are modern and clean with welcoming storefronts. You can get a great view of the village while sipping a cup of quality tea, coffee, or smoothie at the Tomorrow Cafe on the top floor of an obvious structure dominating the village. The old palace of the Yi family remains much intact in the corner of the Hanok Village. Entrance to the palace is 3,000 won (~$2.75) for adults. Here you can find a historical museum, one of the last standing classical libraries, and a royal throne displaying the last original painting of the first king of the Joseon dynasty, King Taejo. A short walk to the west of the Hanok Village, you will find the excellently preserved south gate of the ancient city of Jeonju. The walls of the city were once connected by this gate and three others at each of the cardinal compass points, but during the Japanese occupation, the rest was torn down. The massive structure will give you a sense of the scale of old walls. Just outside the palace walls, you will notice a rising spire that looks strangely out of place. 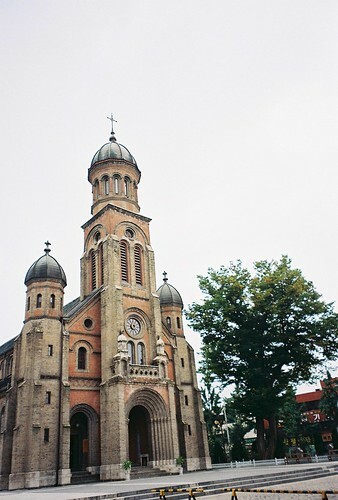 More appropriate for Europe or New England, this Catholic church now stands on ground that was once the site of executions of early Catholics in Korea. Under Joseon rule, Christianity was outlawed because of its subversive tendencies against the strict Confucian system. The church was built between 1908 and 1914 and includes images in the stained glass windows of prolific martyrs of the nineteenth century. This public park provides a series of attractions, most notably a lake packed full of lotus flowers. Beginning in late June, you can see the lotus flowers in bloom. In mid-July or early August, the city of Jeonju holds the Water Iris Festival to celebrate the blooming of the flowers. There are multiple bridges crossing the water allowing for close viewing. Not far from the Hanok Village and the South Gate, you can find traditional shopping at this covered market. There are a couple of restaurants, many produce stands, and a variety of other stores on the street level. Find the stairs to the upper level, and you will find an array of cozy Korean cafes, classic and modern restaurants, and artisan shops. The market stays open into the night when they pull out rows of food stands serving street foods from Korea and other Asian nations. For those into the arts, O’s Gallery and Art House offers a beautiful combination of art and nature. Located about 20 minutes by taxi outside of the city, O’s takes residence in a 250-year-old traditional house. The gallery offers a variety of traditional and modern Korean art as well as craft teas. Though excessive dining must be on your to-do list, Jeonju offers much more. The broadest cultural attraction may be the Jeonju International Film Festival (JIFF). Attracting filmmakers from dozens of countries around the world, JIFF has become a respectable venue for short and full-length films. Though still small in comparison to many other film festivals, the 2015 event topped 60,000 visitors. The centerpiece of the festival is the digital film competition. JIFF provides financial support for three filmmakers to create full-length digital films for the festival. The festival typically takes place at the end of April or early May. Getting to Jeonju from Seoul is quite easy, but it does take some time. A free shuttle for foreigners runs between Seoul and Jeonju every Friday, Saturday, and Sunday from March through December. Because you must reserve a seat, they will check your (foreign) passport on the bus. The bus leaves from the bus depot outside exit 6 of Gwanghwamun station in Seoul at 8 a.m. and departs Jeonju from the parking lot of the National Intangible Arts Center at 5 p.m. The ride takes about three hours, and there is one stop on the way. If you would like to stay overnight, you can book buses on different days. If you want to save a little time and don’t mind spending a little money, you can catch a KTX from Yongsan in Seoul. The trip will take about 1 hour 40 minutes and will cost about $30 for an adult economy seat. Public transportation in Jeonju is more limited than in the bigger cities, but there are buses and plenty of taxis. Tour buses that depart from the Hanok Village for other cities in the area. You can find information at the Tourist Information Center. If you are traveling a group of less than four, taxis are probably the best option for getting around the city. They are reasonably inexpensive and quite easy to flag down. The city bus system can be quite intimidating, so it is recommended that you find a local to help you sort it out if you’re going to attempt this option. The simplest way to get around is going to be your feet. Many of the top attractions are within a few kilometers of each other. If you take the shuttle from Seoul, they will drop you a short walk from the Hanok Village and send you with a tour map. All of us at Reach To Teach have taught English abroad. We understand the anxiety that comes with considering a move halfway across the world. With that in mind, remember that all questions are good questions! We want you to feel as comfortable as possible with your decision. Leaving your home country to teach English in Jeonju is an exciting and adventurous choice. It’s important to be sure you have as much information as possible so you can concentrate on enjoying your year (or more!) teaching English in Jeonju.